SMS Alex Kidd in Shinobi World (USA/Europe) in 06:21.08 by AngerFist. 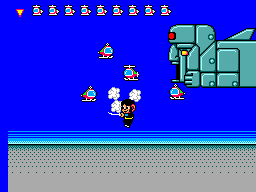 This is the final game of the Alex Kidd series, once Sega's flagship series. As the title suggests, this is a bit of a departure from the other games in the series and borrows concepts heavily from the Shinobi games. Here, Alex Kidd's girlfriend has been kidnapped and he needs to go rescue her. In addition to his bizarre ability to use poles and ropes to turn into a fireball, he also apparently has the ability to use ladders to warp through solid walls. This is an improvement of 12.6 seconds over the previously published run.